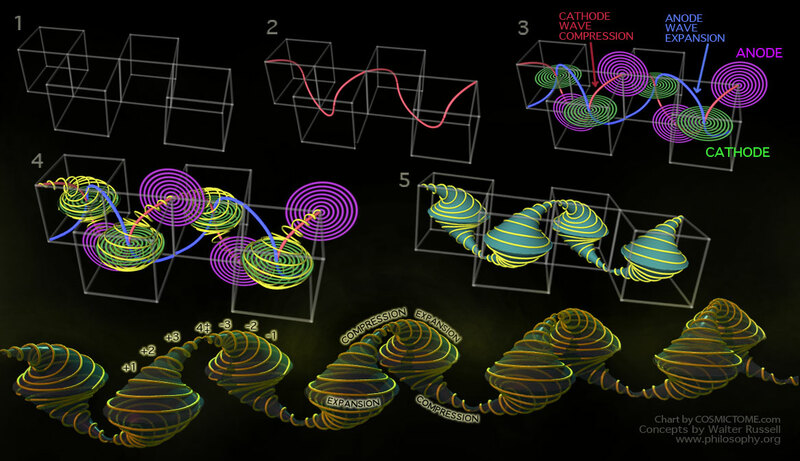 The Lightwave which reproduces itself does so through an intrinsic process, whereby all energetic possibilities are tied to an instructional geometry that builds energetic forms. The universe breathes within itself to ratchet energy into up-scaled energy potential zones and sets free the appearance of free-floating objects that interact with each other. It is pre-written into that same method to repeal the formation process and re-calibrate all of existence in order to meet the new needs of energetic expression. Like a symphony of motion all is bound by the one conductor, the Lightwave itself and the unknown ecstatic energy that propels the entire universal machine. And just as with the ocean, when you dip your finger in, the entire ocean registers that new form within it, shifting itself in entirety to accommodate that new presence. The universal method holds an efficiency that is beyond simple comprehension to allow that process to happen instantaneously, timelessly, while simultaneously giving the appearance of time. This is the duality of existence: to be something and nothing, all at once - a temporary gesture to allow existence, and differentiation, and experience to exist. 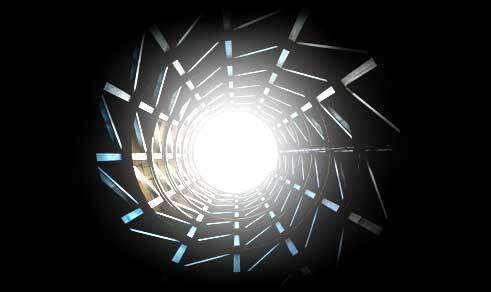 The one light funnels through the Lightwave method to allow the one light to appear as separate forms. All energy and energy structures evolve through a creative process. The scientific philosopher Walter Russell, whose original works can be found at www.philosophy.org, laid out a beautiful and articulate understanding of the aspects of the one universal Lightwave. 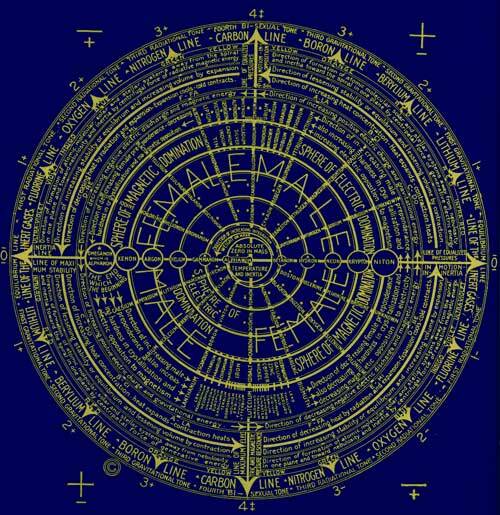 A few of his charts have been modernly enhanced here to follow, mixed with additional perspectives and graphics unique to Cosmic Tome. All energy in expression has a potential range. So extending from any expression of energy is the possibilities of projection within the current environment of any creative act of energy. 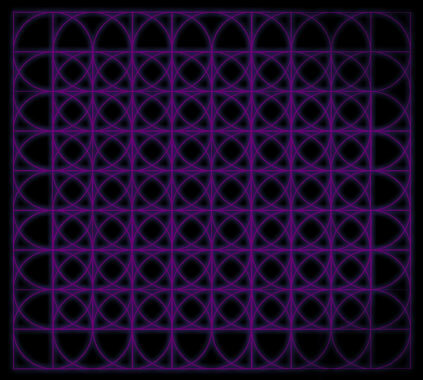 Image 1 shows such a potential grid, through which a singular point of the most simplistic form of energetic expression can potentially evolve. This grid is 3-dimensional, however it is difficult to understand visually in 3D, so it's represented here in 2D. 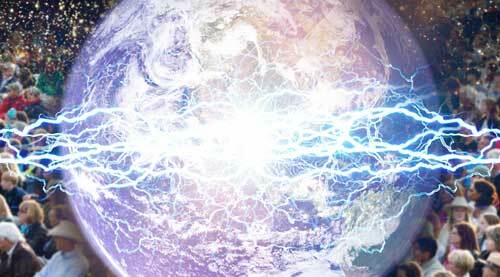 This image represents the prime substrate through which the conditional energy touches and affects the cosmos in the first initiation of energy, from this method is exuded the universal separation process which entails energetic evolution of one energy type into another, methodologically. This image is also a partial 2D representation of a 3-Dimensional concept that is impossible to render 3-Dimensionally without total visual clutter. Imagine the appearance of stillness, from which comes the very first motion, which becomes the very first change. 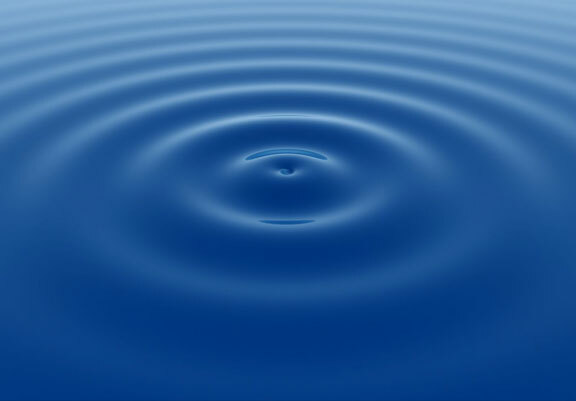 From that change can be seen the first effect of motion and the first subtle shift from what appears to be the first created aspect of the universal light. 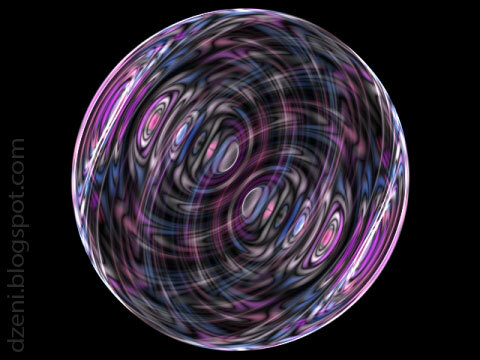 The ripple in the previous image is not 2-dimensional - rather it is a 3D dimensional change, and so that ripple can be imagined like this, a spherical ripple. 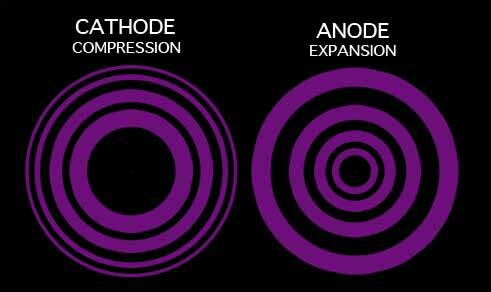 The Anode / Cathode states best describe how energy creates and maintains such a ripple. Energy at any given time predominantly displays either compression or expansion - however all energy holds both characteristics at once, simply one is more influential than the other at any given time. 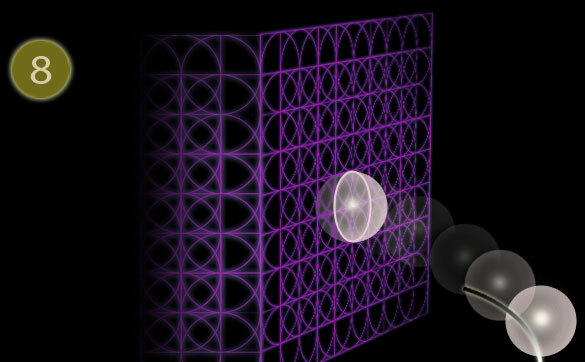 - bound into subatomic particles or atoms that hold energy for great duration of time, and also from which subtler forms of energy like heat, light, or radiation can be emitted. Here the first threshold has been met, winding the Universal Light into a Bound System. 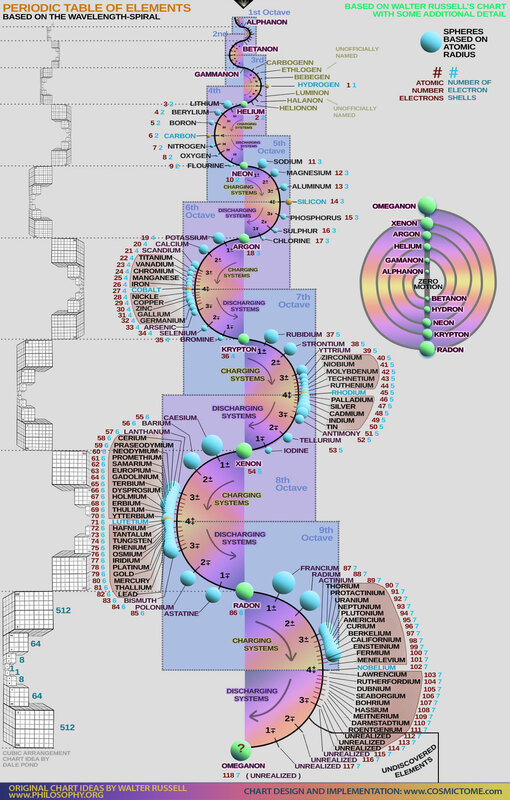 The Life of this Bound Energy System will entail either an unwinding of its life energy - OR if environmental conditions create the proper pressures, this unit will evolve down the pathway of expression found this periodic chart. 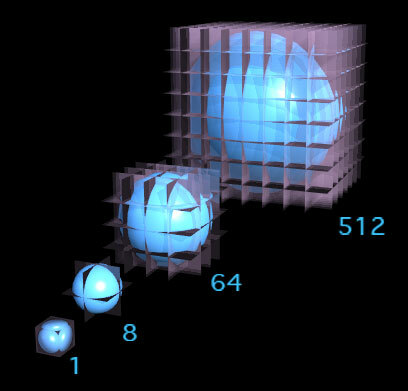 Displays motion according to projecting wavelength - energy is radiated spherically unless obstructed - and these spherical projections can be pushed into directional expression if the environment insists upon it - such as a bolt of electricity. 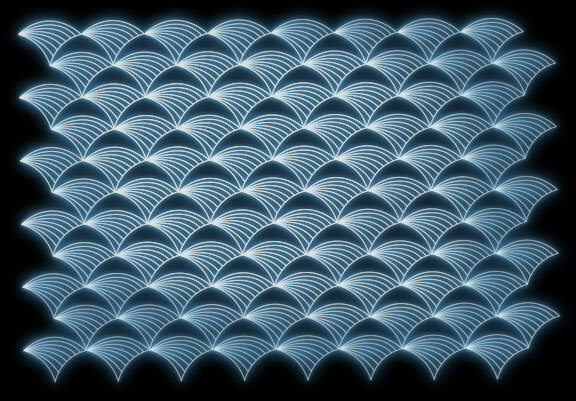 The wavelength pattern of the Lightwave holds internal limitations - represented in this next image by a series of pictures that come from one concept split apart visually here for simplicity of understanding. Compression and expansion reveals the method by which nature alters the state of energy in the evolution of periodicity that determine the shape of all form. 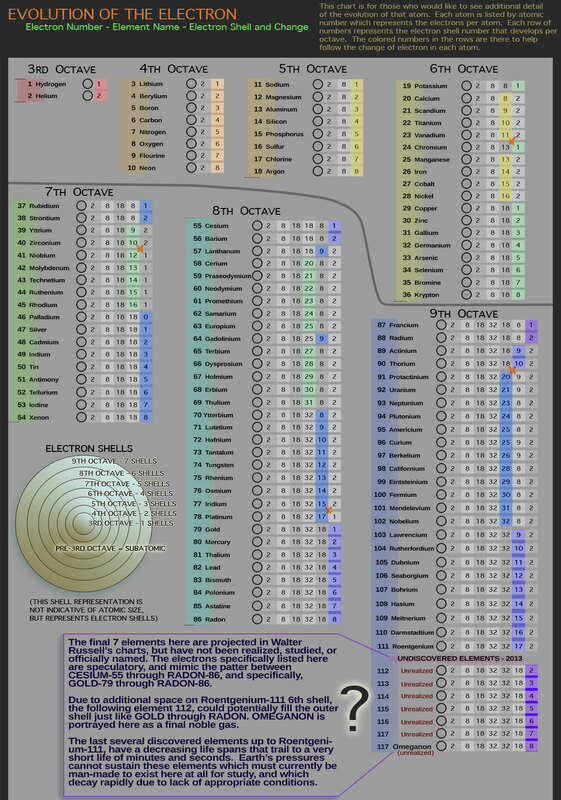 The complete chart in it's original form, as design by Walter Russell is next. 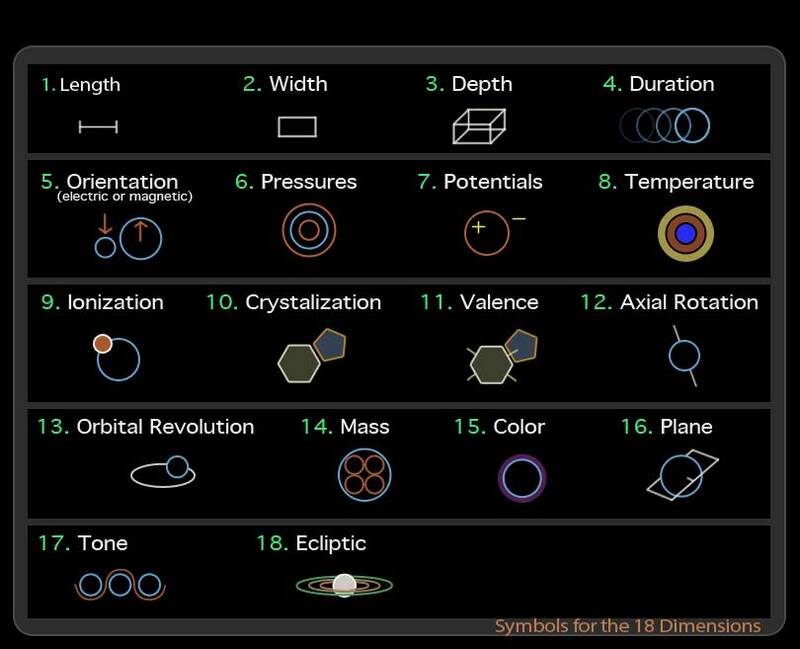 This chart can be found in his original works, as well as an incredible series of knowledge and perspective. The elaborated version of Russell's cosmogony and material science can be found directly found directly at www.philosophy.org. His book called The Universal One holds the most elaborated compacted portrayal of this information, but many of his other works made the information more accessable to those who wanted a less concentrated form. What has been discussed is a universal creation method that yields a beautifully connected universal theory, or cosmogony, as it's called. In discussing the way energy evolves, we find a simple platform to discuss connectivity, which certainly brings people to better understand a major aspect of our place in reality. However, there should be one more important step to visit, a simple acknowledgement to how human beings fit in the evolution pathway itself. How the stars and atoms have been constructed has been symbolically discussed - but we must also recognize how the human being has developed more elaborate structures to show more intelligence and articulation of action. It was written in the universal method, from the very beginning that the Lightwave would manifest energy, then material, then the first simplistic chemical processes, then series of processes stored as the most simple lifeforms. Over countless millennia the nature of life has evolved complexity, elaborating to expose desire to new avenues of experience. Environmental changes, and physical endurance have led to selective processes and the evolution of DNA directly in existence. This process takes time and many generations, but the arrival of more complex lifeforms, then intelligent lifeforms has happened by no coincidence.